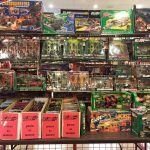 Giant GI Joe Collection Now at Century III! Check out all the sweet GI Joes that just came in! It’s a massive collection! On sale now at NDC Century III! ← 3 RIVERS COMICON EXCLUSIVE BEER PARTY!